When setting up a virtual call center to work from home as a customer service rep, telemarketer or tech support agent, you will most likely need your own home office equipment to get started. Typically it is the responsibility of the employee or contractor to purchase and maintain all the equipment needed. Though, there are a few companies like Apple that provide some of the equipment. As you consider the issues of starting a virtual call center, the home office requirements will likely top your list of concerns. Companies hiring for virtual call center jobs all have different requirements for office equipment, and so you will need to carefully check out the requirements for equipment in every job you apply to. 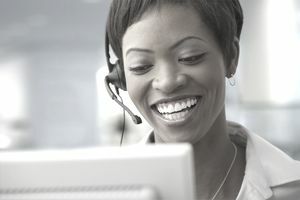 But usually, the virtual call center agent must provide and maintain computer and phone equipment, software and phone and internet services. As a general guide, these are some of the technical requirements that may be expected for a home-based call center. Each company's specific requirements will differ. Windows operating system - Which version varies but keep in mind that newer isn't always better; some companies are slow to adapt to changes. Virus and spyware protection software and a working firewall. Software programs that may be required include Microsoft Office (Microsoft Word and Excel), and/or Adobe Acrobat reader. Broadband internet connection. DSL and cable are usually allowed but satellite, dial-up and wireless Internet connections are usually not. A wireless network inside the home is sometimes allowed, but many companies will require that computers are connected directly to the internet. Landline phone service. Cell, VOIP (i.e Vonage) and cable phone lines are not often not acceptable, though cable is becoming more common. However, there are some companies now who don't require any phone line because the connection is all done through the internet. Of the companies that do require a landline, many require it be a dedicated phone line separate from your home phone. Calling features on the phone line, such as call waiting, call blocking and voice mail, are often not allowed or must be disabled. Corded telephone (with buttons not on the handset) if a phone line is used. Corded (not wireless) telephone headset with a noise-canceling microphone. Instant message account. Occasionally something like Yahoo Messenger is required but often companies have their own systems. Skype or another teleconferencing service. Occasionally this is required but it is free. Email account. A few companies require specific provider. Printer. Not all companies require printers. Quiet, private workspace. Most companies will require that your workspace is in a separate room with a door and even a lock. Is Arise Virtual Solutions a Good Work-at-Home Opportunity? What's It Like to Work at Hilton@Home? How Much Can You Make With a Home Call Center Job? Can You Work From Home for GE? What Type of Call Center Jobs Are There?